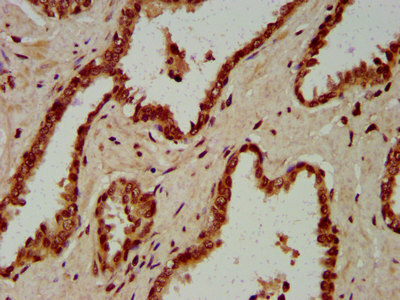 IHC image of HIST1H4A (Ab-1) Polyclonal Antibody diluted at 1:50 and staining in paraffin-embedded human prostate cancer performed on a Leica Bond™ system. After dewaxing and hydration, antigen retrieval was mediated by high pressure in a citrate buffer (pH 6.0). Section was blocked with 10% normal goat serum 30min at RT. Then primary antibody (1% BSA) was incubated at 4°C overnight. The primary is detected by a biotinylated secondary antibody and visualized using an HRP conjugated SP system. 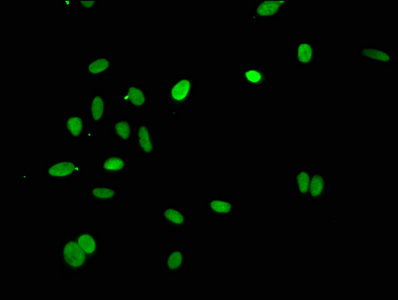 Immunofluorescence staining of Hela cells with HIST1H4A (Ab-1) Polyclonal Antibody at 1:25, counter-stained with DAPI. The cells were fixed in 4% formaldehyde, permeabilized using 0.2% Triton X-100 and blocked in 10% normal Goat Serum. The cells were then incubated with the antibody overnight at 4°C. The secondary antibody was Alexa Fluor 488-congugated AffiniPure Goat Anti-Rabbit IgG (H+L). 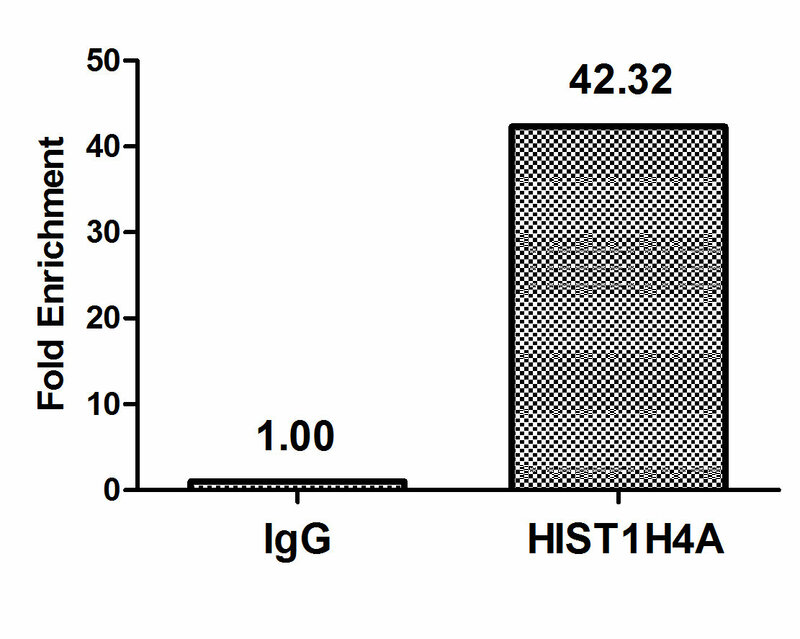 Chromatin Immunoprecipitation Hela(4*106)were treated with Micrococcal Nuclease, sonicated, and immunoprecipitated with 5ug anti-HIST1H4A or a control normal rabbit IgG . The resulting ChIP DNA was quantified using real-time PCR with primers against the β-Globin promoter. 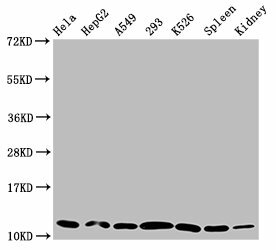 HIST1H4A (Ab-1) Polyclonal Antibody. Unconjugated. Raised in: Rabbit.